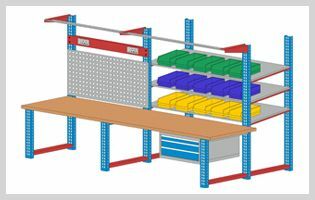 Being prominent manufacturer of workstation and workbenches, we provide modular workbench or workstation. It is completely customizable workstation. This tailor made work benches and it’s racks, trolleys and frames are made from 1.5mm thick slotted C Channel. Modular workbench can also equipped with adjustable shelves, drawer cabinet with divider and partition, bench top, perforation panel and overhead tube light. It can be equipped with tool holder hooks to keep inventories and tools. With these accessories, caster wheels can also placed as per need. Variety of caster wheel option provided for different kind of flooring and mobility to keep the workstation as per need. It efficiently works for well managed and safe working environment. It is highly demanded for various industrial as well as commercial operations of different industries. Industrial Workstations are sturdily constructed with rigid welded joints. It works with vibration free manner also for the heavy duty work. We provide ergonomically designed workbenches. Sturdily constructed workbenches ideally perform in daily heavy duty work in the workshops with smooth and vibration free manner.